What does it feel like to cycle light as a feather along paths and roads throughout the world? And if that lightness consisted of bike bags full of travel gear, photographic equipment and the necessary items for spending several months on a bicycle tour? 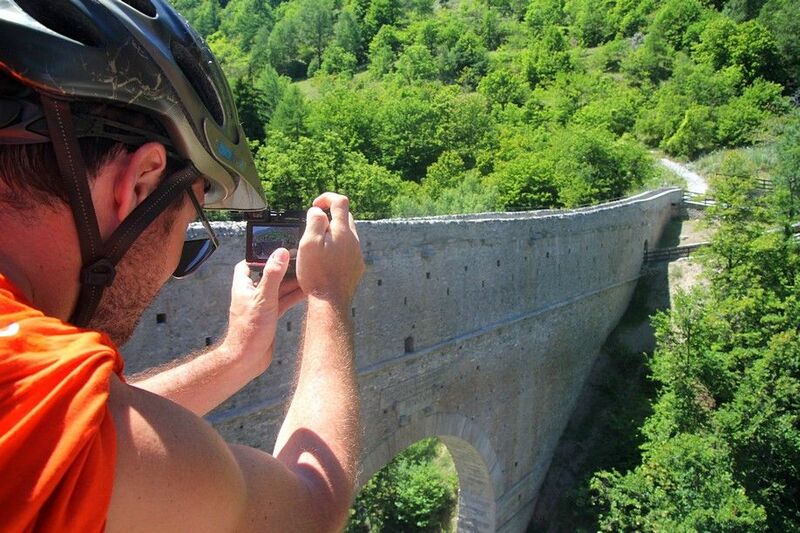 When organising a cycling trip, the magnitude of your passion for photography can have a big influence on your final weigh-in and so it is very important to understand what to take and what to leave at home. Reflex, the queen of all cameras. As well as being not exactly lightweight, it also requires at least one combined lens in order to do its job properly. Carrying a reflex during a bike trip is definitely hard work, but the amazing photographic opportunities it affords will repay the bravest of you for all the extra effort. As well as having many great features, reflex cameras also enable you to take high resolution pictures (and videos) that successfully produce superb quality prints. Wideangle lens (under 17 mm). This focal length is above all suited to nature photography, for which you often find yourself in wide, open spaces. It can be fun to use on foreground subjects placed in an interesting context, in order to add depth of field to the image. Telephoto lens (from 100 mm upwards). This focal length is more difficult to use, and is good for getting shots of details from a considerable distance and animals or birds in particular. There are some telephoto lenses that reach 600 mm (and 5-6 kg or more in weight) but these are not suitable for taking on a cycling adventure. Lens filters. They don’t weigh much and vary in price and use. An essential filter for nature photographs is the polarising filter. Once you’ve tried it, you can’t do without it. Tripod. A photographer never travels without his tripod and, even when travelling on two wheels, there is no excuse. The good news is that there are some lightweight tripods designed especially for travellers… including those on a bike. Remote shutter. It weighs nothing and is essential for long exposure shots. Compact camera. There are some really high quality compact cameras on the market and, as the name suggests, they are practical to carry on your travels thanks to their small size, volume and weight. They are less versatile than a reflex camera with its accessories and the image and video quality is not always perfect, but they can be a valid compromise for a cycling traveller. Smartphone and mobile phone lenses. There are a vast number of models on the market, of which some are able to produce images and videos of excellent quality. They are lightweight and easy to carry and are ideal if you want to share your photos with friends and family almost instantaneously on the various social network sites or over the internet. These devices do, however, have a couple of negative features we can’t ignore: smartphones can cost as much as a reflex camera or more and, given that they are designed for a purpose other than photography, so far they are always equipped with a battery that often lasts just a few hours. For the past few years, the market has also offered lenses that can be attached to your smartphone, allowing you to vary focal length and, therefore, your final image. Action cam and pole mount. There are some excellent ones on the market. As well as producing great video clips, they can also take photos of good enough quality. They don’t weigh much and can easily be used for motion shots, thanks to an effective continuous focus feature. They cost a substantial amount and, as far as photos are concerned, they don’t give you the same quality of image that you find with a reflex camera. Action cams can be attached to the handlebars using a special mount, to your helmet or to other parts of your bike, so that you can vary your shots. Using the pole, you can take pictures of yourself on the move and shots from unusual angles. What type of cycling traveller are you? 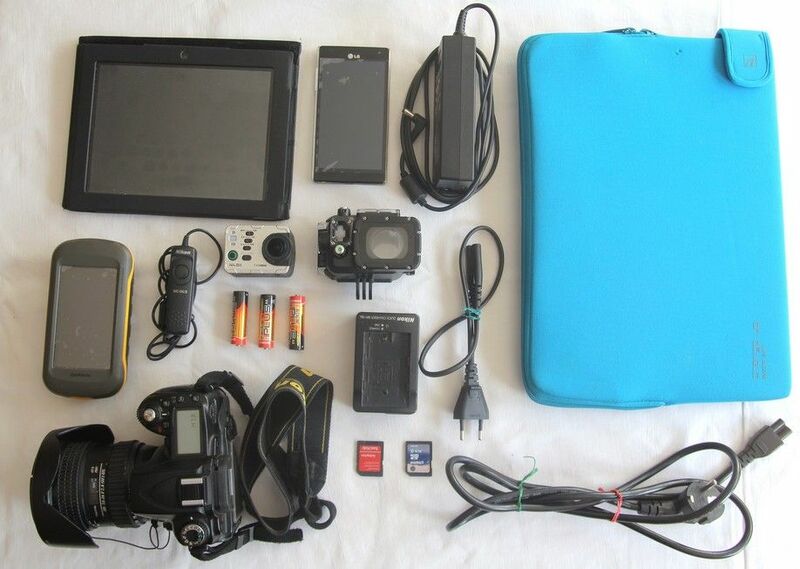 Choosing photographic equipment for a bicycle tour is neither easy nor predictable. Before making any decisions, you need to think hard about your priorities: do you prefer to travel light and fast or with a bit more weight to carry? Do you prefer nature photography or are you happy with souvenir shots of your travels? What’s your budget? Do you know how to use a reflex camera and its accessories or are you buying it just to follow the trend? Once you have answered these questions, you will be ready to organise your photography kit and set off on your bicycle adventures! Personally, we always travel with our reflex camera, a couple of lenses (wideangle zoom and telephoto zoom) and a lightweight tripod, together with an action cam for videos or more “extreme” shots. This means our pace of travel is slower, exacerbated by the time (although minimal) devoted to studying the framing, getting the right exposure and using the equipment. Therefore, if you want to cover long distances on your bike, dismiss this option immediately and “settle for” a compact camera or your smartphone, with which you can still produce decent images.